A milestone! From week 37 onwards you may opt for a home delivery if that is your wish. You will most likely be wondering how long the delivery will take. For a first delivery then you can reckon on average one hour for each centimetre dilation. However the first few centimetres can take much longer. Sometimes the first few centimetres are slow but the last few really quick. 37 weeks pregnant – how is your baby growing? Your baby is now approximately 46 to 47 centimetres long and weighs about 3000 grams. 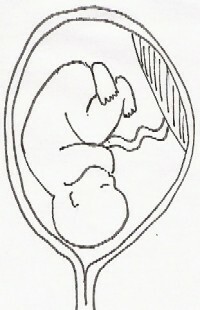 There is meconium in the intestines, the first stool. It is greenish-black in colour, thick and slimy and gives an unpleasant mark on clothes. The first stool comprises of lanugo (downy hair) that was floating in the amniotic fluid, cells from the intestines, waste from his digestive glands and bile. The last element is the reason for the greenish-black colour. It will take a few days before your baby’s stools are normal.